Annamaria began her musical studies at a very young age with the cello, piano, organ and chamber music classes in Hungary proceeding later to her final degree at the famous academy “Franz Liszt” in Budapest where she achieved the highest category of honours in both performance and teaching. Following her arrival in Italy she studied with Christian Bellisario at the ‘Verdi’ conservatoire in Milano achieving a brilliant final diploma and is currently part of the very select group studying with Rocco Filippini in Cremona at the ‘W.Stauffer’ academy. She has participated in several masterclasses with the maestri Enrico Dindo and Marco Scano. In addition she is frequenting the course of ‘Ancient Music’ with Renè Clemencic and also studied viola da gamba at the International Academy of Ancient Music at the Civic school of Milan. Annamaria has participated in many international competitions with prestigious recognition both in Italy and abroad. 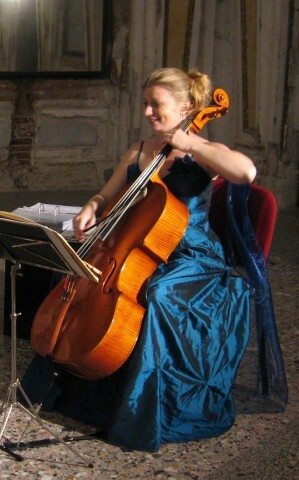 Annamaria was principal cellist with the Orchestre Symphonique du Mont-Blanc and from 2004 to 2008 worked with the orchestra U.E.C.O. and the ‘Orchestra dei Pomeriggi Musicali’ in Milan. She has an intense performing career in many ensembles and chamber groups. She has taught cello at the Sir James Henderson School British school for several years and at the “Luca Marenzio” conservatoire in Brescia.